Along a stony beach in the sunny south-east I was absentmindedly combing the area for interesting pebbles and shells. The gentle hum of wind turbines on the headland above and the hiss of the waves as they swept back over the stony shore. Flotsam, bleached wood and sea-weed torn from the ground scattered the shoreline when I came across a Johnnie Walker bottle. 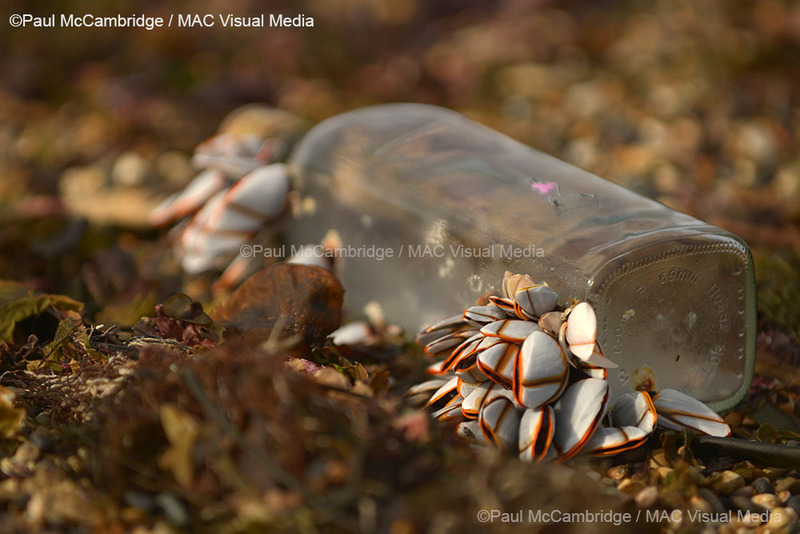 The label washed off save for the man himself, striding out, his jacket now sea-bleached from vibrant red to pink, this empty bottle now the traveling home to a growing colony of young mussels. I wondered how long these pretty molluscs had floated around the seas, clinging to their dubious life-raft. The irony of a bottle of Scotch lying on the Wexford shores was not lost on me but I think it would not be long before the colony would increase and cover the entire bottle. Sometime in the future this little colony might return to the shore and the beach-comber who finds them may not even recognise that under the layers of smooth, pearlescent grey gleaming shells crowded together, their tiny raft is in fact glass. 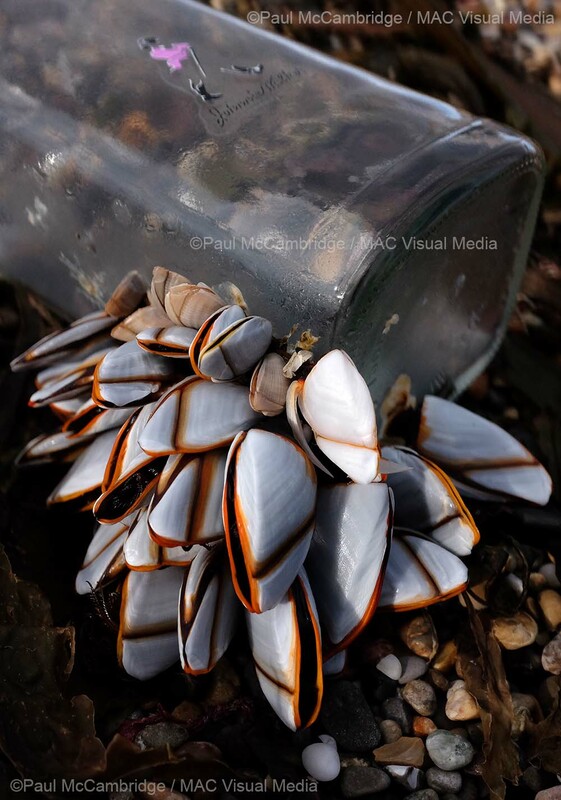 The vibrant orange lips of each shell stood out against the grey, gleaming in the evening sun. Crowded together tightly, every so often a shell would open a little and the hair-like gill would push out, testing for the returning water perhaps? To attach to rocks, ropes (or whiskey bottles), mussels secrete a liquid which sets in contact with seawater formingbyssal threads or beards. This cement is so strong the mussels can even cling to Teflon – try getting them to let go of whiskey! Scientists are trying to develop a mussel-based adhesive for eye surgery. Mussels with thick blue shells probably lived on shore where they need strong shells for protection. Those living off shore or in pools constantly covered by water grow quickly and have a thinner shell. Mussels are rich in protein with less fat and more nutrients than beef. The mantles of lady mussels are orange while gents are creamy white. The size of mussels varies with the season, largest and fleshiest in October and smallest in March. Mussels have been cultivated and eaten throughout the world for over a thousand years. I couldn’t contemplate eating these pretty fellows though and wish them well on their journey.